Central pavilion of the John Owens Building, which has entrance bays and wings either side. The John Owens Building is named after John Owens (1790-1846), the wealthy cotton merchant who founded Owens College in 1851. 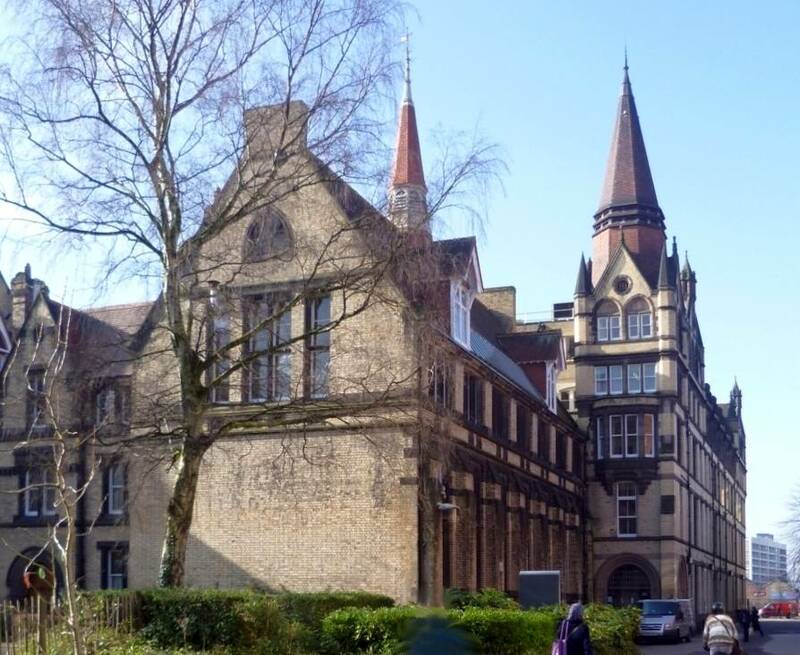 The institution had originally been housed in Richard Cobden's old house in Quay Street, Manchester, where the firm of Travis & Mangnall rebuilt the stables to provide a lecture room and laboratory (see Parkinson-Bailey 113). 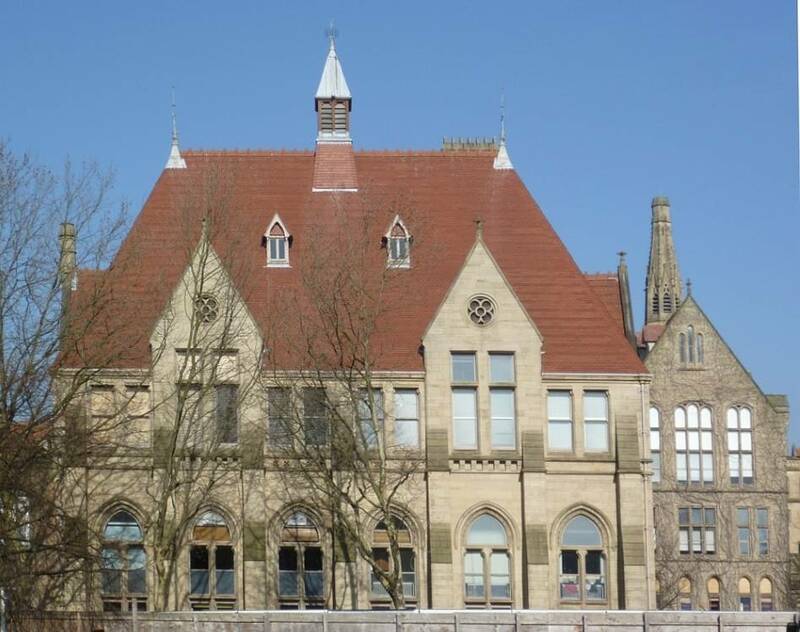 In 1869 Alfred Waterhouse (1830-1905) was commissioned to design a purpose-built campus for the college in the Chorlton-on-Medlock area to the south of the town centre. The west range, featuring the present John Owens Building, was the first part to be finished. It provided both teaching and administrative facilities (cf. Waterhouse's later Victoria Building at the University of Liverpool). Since it is back from the main thoroughfare of Oxford Road, practicality was the watchword here, rather than show. Nevertheless, as Clare Hartwell says, it is the "most characterful part" of the complex (108). Views inside the main quadrangle from different angles, looking left and right of the John Owens Building. Left: To the far left is the edge of the Christie Library (1895-98). Right: This early line-illustration shows the Beyer Laboratories building on the far right, marked by its rather chunky stone spire or flèche, dating from the mid-1880s (source: Thompson 463). The sides of the quad were filled in later, first with the Beyer Laboratories building, dating from 1883-87. 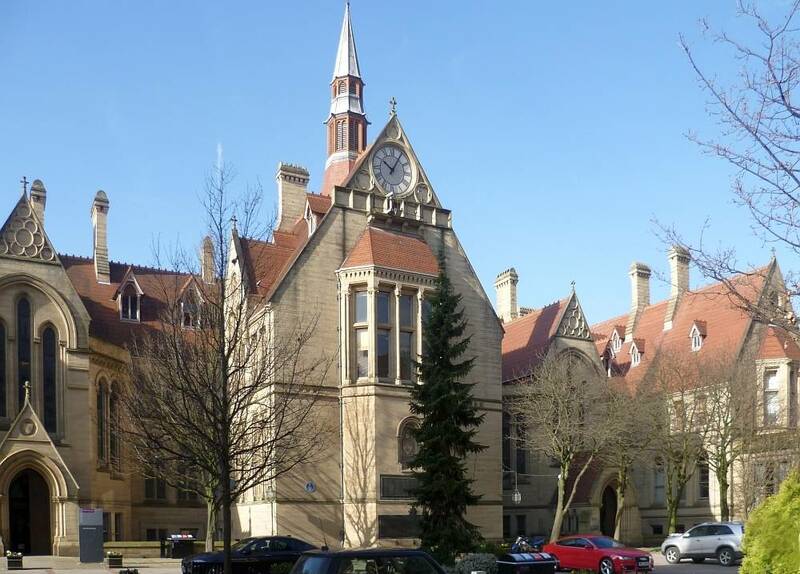 It was named in honour of C. F. Beyer of Beyer, Peacock and Company, locomotive engineers, an important benefactor and a member of the Extension Committee (see Parkinson-Bailey 51), and is attached to the Museum on Oxford Road, allowing zoology students easy access to the collections there. With its warm-coloured stone, its pared-down or "modern" take on the Gothic, and its arrangement around an open space, the architecture of this part of the quad is very attractive. Variations in heights, bays, and window styles and placement, make it interesting, while its shared features — gables, dormers, steep red-tiled roofs, array of chimney-pots and occasional spires — bring it all together. The buildings "form a convincing whole in style, form and massing," says Hartwell (1(08). It is worth noting that Waterhouse's interest in "the enclosure and linking of space," as well as his "penchant for dormer windows" and love of spires, went back to his nine-month Continental tour as a young man (see Cunningham and Waterhouse 15, 184,185). As the line-illustration shows, the quadrangle would have looked more picturesque in the nineteenth century, before it was used as a car park. The view on the left was taken from perhaps the most distinguished early twentieth-century buildings on the campus, the neo-classical former Faculty of Arts building. From here, the "short end" of the main range, in other words the John Owens Building, looks like a separate building. To its right side is the way through to the quadrangle, where the Beyer Laboratories building looms on the opposite side of the quad, looking rather like a religious establishment. One reason for its venerable appearance is that it is criss-crossed by vines of Virginia creeper now, making it particularly striking in autumn when the leaves change colour. As the plan grew, "visual effect would have been Waterhouse's aim, rather than historicism" (Hartwell 108) — not only that, but fitness for individual purpose as well. The versatile architect had already designed the college's Chemical Laboratories in 1871-73 (opened in 1874; detailed plans for this can be seen in Roscoe and Waterhouse), and would later design the Schorlemmer Laboratory (opened in 1895), both in the rear courtyard behind the main quadrangle. The latter opened in 1895 and was state of the art for its time (see Hartog 64-66). Along with the early Chemical Laboratories, the first phase of the complex included the medical school, also to the rear of the main quad. All these buildings, being further back, were in brick, but a buff-coloured brick that went well with the quad's stone. 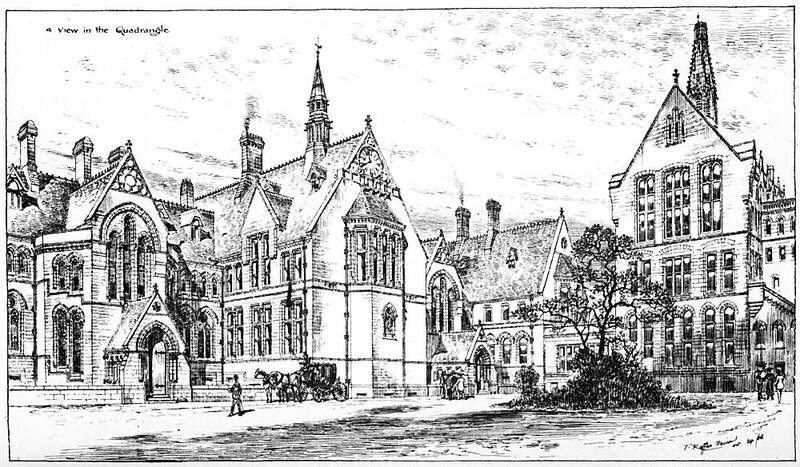 As for the medical school, shown above right, Owens College incorporated the Royal Manchester School of Medicine in 1872, and the new building that opened in 1874 was followed by two extensions, in 1882-83 and 1891-94 respectively. The long building with the attractive corner tower, pinnacles and pyramidal roof was the one added in 1891-94. Again, it is an attractive grouping. As Hartwell says, "the views down the streets on either side of the quad, Coupland Street (N) and Burlington Street (S), are also carefully managed" (109). 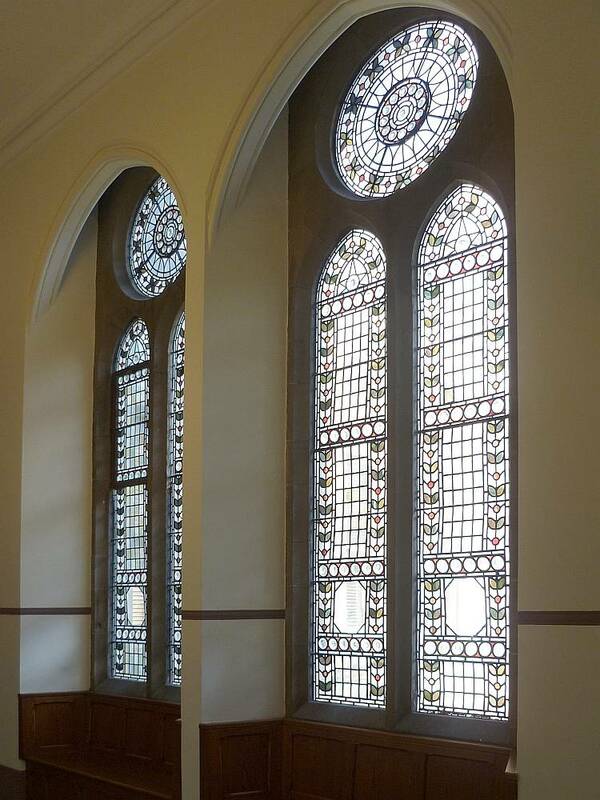 Left to right: (a) Geometric stained-glass patterning, hinting at foliage, in the windows of a corridor. 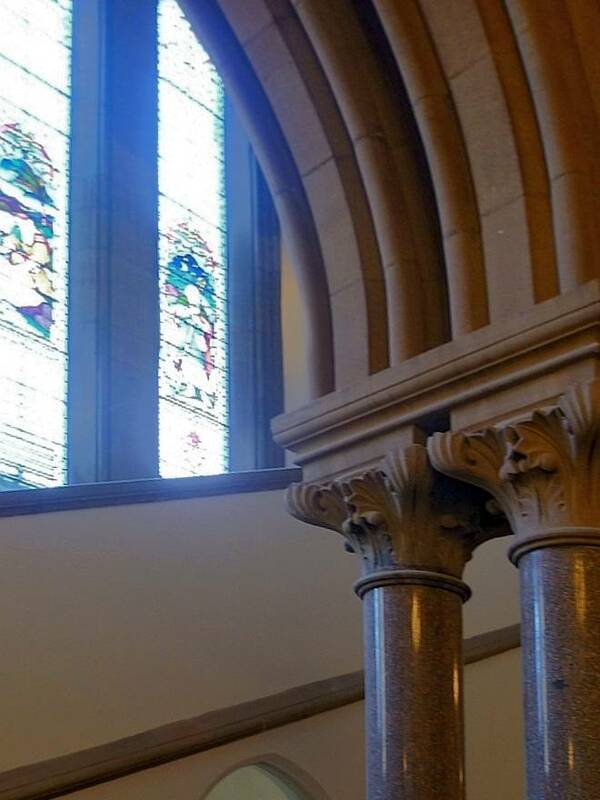 (b) Details: polished granite piers, leafy capitals, arcading and stained glass figures in the windows of a stairwell. 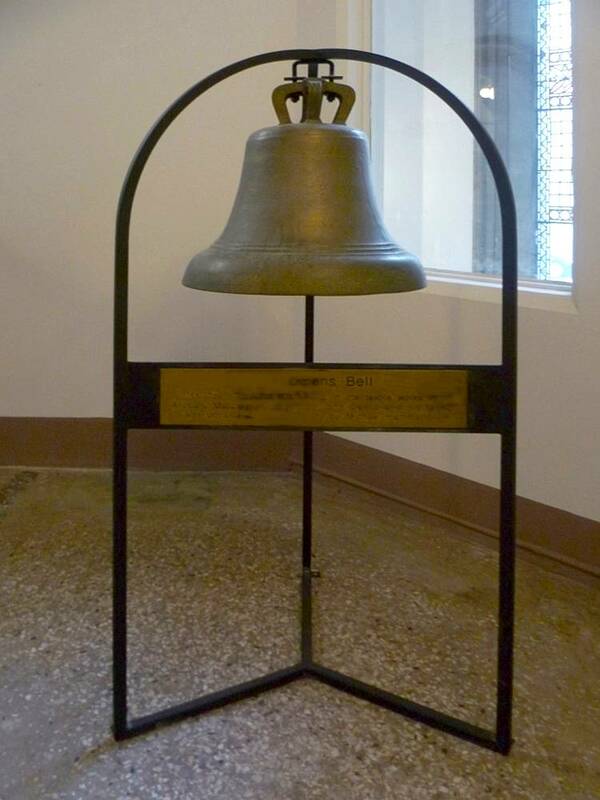 (c) The Owens Bell, which once "hung in the textile works in Ancoats, Manchester, owned by Owen and his family" (inscription). Ashton added that this was only the beginning of the scheme, and that there was much left to be done. And indeed the college originally built on the fruits of the textile industry (of which the Owens Bell is a dramatic reminder) was to grow considerably, not only with extensions at the sides and in the rear courtyard, but, most impressively, with the completion of the quad by the grander and more imposing Oxford Road frontage. 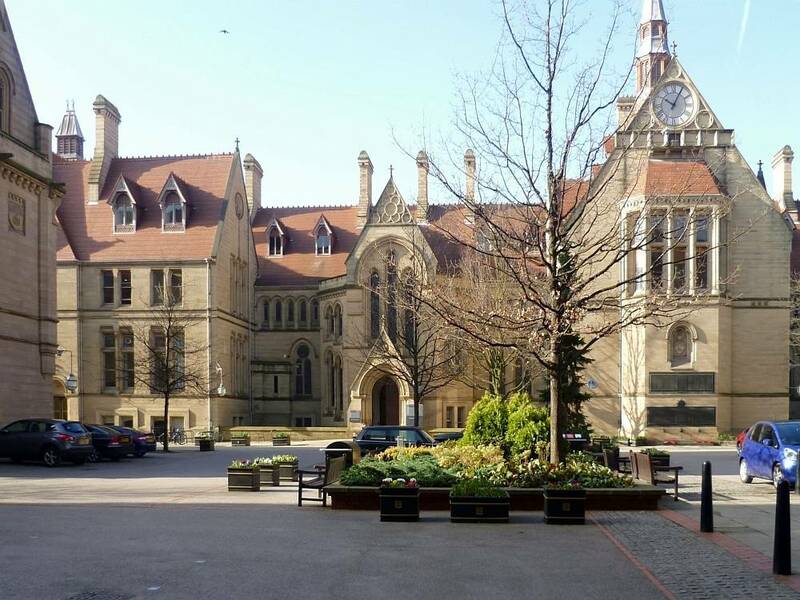 But the buildings behind that frontage are where the institution's origins lie, and are perhaps the best proofs of Alfred Waterhouse's skills in developing a campus with a traditional feel, — one that is varied and pleasing from all angles, with open outlooks from the individual buildings, and set out on a warmly human scale. Roscoe, Henry E., and Alfred Waterhouse. 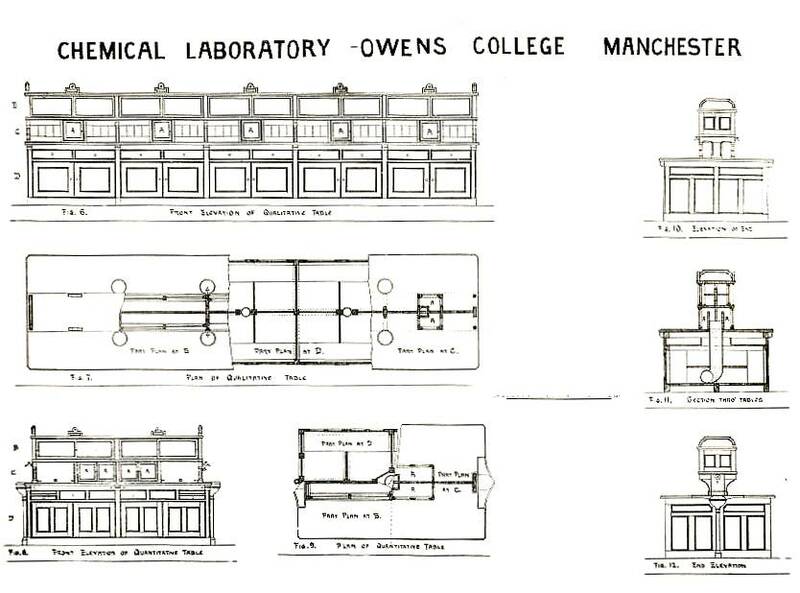 Description of the Chemical Laboratories at the Owens College, Manchester. Manchester: Cornish, 1878. Internet Archive. Web. 9 September 2012.